LAST UPDATED: 22/8/18 - Here are ten of the best places to visit in Namibia, the wild, dramatic, vast and breathtakingly beautiful south-west African tourism hotspot, and one of our favourite places to visit... EVER. Epic. If there’s a word used too often when it comes to describing stunning landscapes, then ‘epic’ is probably it (check out our Namibia photo diary for proof). Yet standing under endless starry horizons, in the middle of vast desert plains and shimmering wildlife reserves of Namibia, it’s the only word that truly seems to fit. Wild and dramatic, vast and breathtakingly beautiful; from the soaring dunes to the depths of Africa’s largest canyon, Namibia is a must-see for any traveller looking for something a little different on their next holiday (or just to feel really, really tiny on this big blue dot). And what's more, Namibia is super affordable right now; it was rated the #2 best value destination in Lonely Planet's 'Best in Travel 2017'. Here are the 10 best places to visit in Namibia, the land of endless horizons. If you only have time to see one thing in Namibia, make it the red desert dunes of Sossusvlei. It’s a big call considering the whole country is remarkably beautiful, but there aren’t many places on earth that boast a landscape quite as special as this one inside the Namib-Naukluft National Park. Few words can describe how it feels as you stand before a towering orange sand dune stretching some 300m towards the bright blue sky, walk amongst 900-year-old fossilised Acacia trees in the vast white clay pan of Deadvlei, or touch the shifting sands of the world’s oldest desert, the Namib. The best time to see the dunes in all their glory is during sunrise, when the light coming from the east paints them in vivid black and orange contrasts. Get your exercise in by climbing the most accessible, Dune 45 at sunrise, then explore Deadvlei or Big Daddy in the late afternoon, when the golden light again illuminates the area in all it’s magnificence. Read our in-depth Sossusvlei travel guide for all the information you need. Where to stay in Sossusvlei | If you’re camping, Sesriem Camp, located inside the park grounds, is a great option. Not only is it a cheap alternative to the lodges external to the park, you’ll also be inside the park and able to travel inside the park at your will; perfect for photographers aiming to capture the late sunset, or star-scapes, or those trying to avoid the crowds. Alternatively, you can stay at Sossus Oasis campsite outside the grounds. See our photographic journey through Sossusvlei, Namibia. Standing at the lip of Fish River Canyon, it’s not hard to see why local legend has it that this dramatic chasm that snakes through the dusty Namibian landscape was whiplashed into existence by the tail of an angry dragon. At 160km long, 27km wide and up to 550 metres deep in parts, the jagged canyon is the second largest in the world, after the Grand Canyon, and is guaranteed to make you feel tiny in the best possible way. At 500 million years old, it also counts its birthdays in the league of ‘almost as old as time itself’. If you’re there towards the end of summer, you might also be lucky enough to catch sight of the Fish River as heavy wet season rainfall transforms from a series of narrow interconnecting pools on the canyon floor into a raging flash flood. With views over Hell’s Corner (a sharp bend in the Fish River below) the Fish River Canyon viewpoint is probably the best place to snap your best shots, though it’s definitely worth exploring the rocky outcrops to either side of it to get a feel for the sheer scale. If you’re feeling really brave, take on the challenge of the four-day day Fish River hike that winds along the canyon floor. Tough going? Yes. Unforgettable? Absolutely. Etosha isn’t called Namibia’s greatest wildlife reserve for nothing! Despite the semi-arid surrounds, the many waterholes scattered through the park promise some epic game viewing of lions, elephants, giraffes, antelope, springbok, zebra, wildebeest. It’s also home to some extra special inhabitants: the endangered black rhino, and the elusive and very shy leopard. Unlike many African safari locations, with their long grasses and scrubby bush features, Etosha also boasts an entirely distinctive feature: the Etosha pan. This white salt pan gives the park it’s name (etosha means ‘great white space’) and can be seen from space. After good rains the pan transforms into a lake, attracting a pink cloud of flamingos in their thousands just in time for breeding. PSA for adrenalin junkies everywhere: if it’s adventure you seek, Swakopmund is your ultimate paradise. Whether it’s skydiving over the Namib desert and the rugged coastline, tearing it up as you sandboard down the dunes, 4-wheeled sand adventures by quad bike and 4x4, or floating on the breeze as you paraglide down Swakop’s giant sand dunes; there’s action-packed fun here for everyone. For those looking for slightly less heart-racing experiences, there are also fishing expeditions, scenic flights, dolphin and seal catamaran cruises, and living desert tours to enjoy. Once you’ve worked up an appetite you can stop off for a traditional German schnitzel at one of the pubs in town. Yep, that’s right. 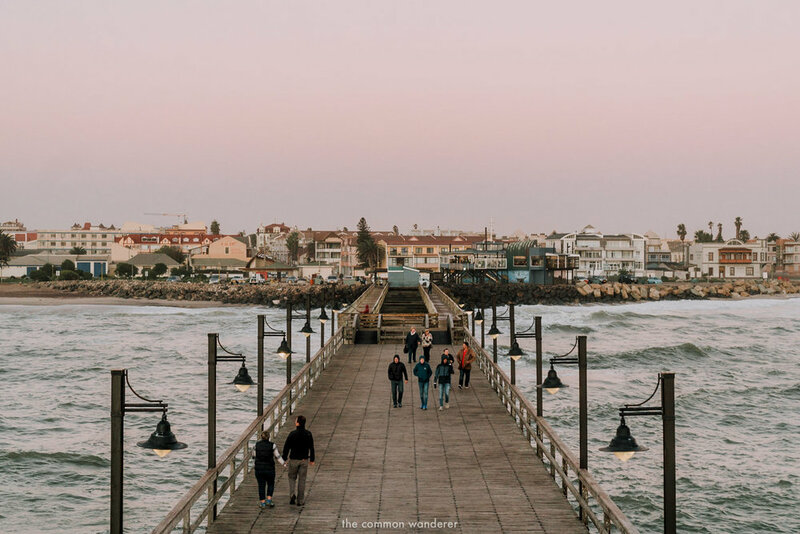 A former German colony, exploring Swakopmund is just like stepping straight into a little german town; the architecture, language, and food all reflect its colonial history. 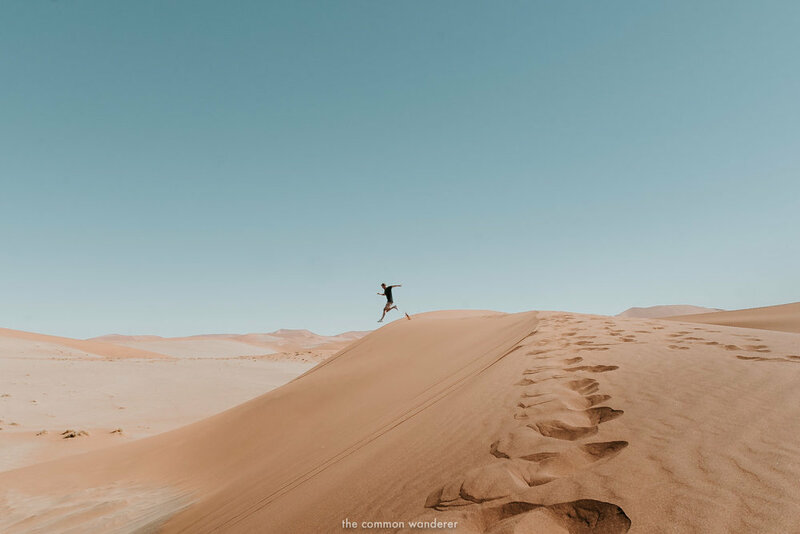 Recommended tours | There are a heap of tours based in Swakopmund - one of the best is the Swakopmund self drive Namib desert adventure tour (click the link to book). But it’s a heady mix of bleak desolation, harsh terrain, and treacherous history that make the menacing sounding Skeleton Coast the tourist attraction it is. This is the place where the wild desert meets the sea, the Atlantic’s cold Benguela current colliding with the hot, dry air of the Namib desert to create a fog that rolls thickly over the sea. Coupled with a howling wind and strong water currents it’s little wonder that hundreds of unlucky ships (and their seafarers) have met their demise along this coast over the centuries. Some of the shipwrecks are still clearly visible today, while the skeletons of whales and seals litter the shoreline, the last vestiges of the old whaling industry. If that wasn’t enough, desert lions and elephants still stalk these dunes too. Despite its eeriness and lack of hospitality, the Skeleton Coast remains some of the most pristine coastal wilderness in Africa - and potentially the whole world. It might be bleak, but it’s also stunningly beautiful. Where to stay in the Skeleton Coast | It's best to base yourself in Swakopmund and explore the Skeleton Coast from there. Cape Cross is famous for two reasons: seals, and Portuguese exploration. At first sight the beach appears blanketed in thick black sand, the wriggling shapes of over 100,000 fur seals only becoming clear as you move closer. This is the world’s largest breeding colony of Cape fur seals, who flock here to mate and take advantage of the rich supply of fish in the currents. Wander along the boardwalk (watch out for seal pups who have strayed onto the path!) and take in the sights and sounds of this unique community as they frolic in the turquoise water, and warm themselves in the Namibian sunshine. Just bring something thick to cover your nose. No really. You’ll thank us later. It was also at this headland that celebrated Portuguese explorer Diogo Câo landed on the Namibian shoreline in 1486. Câo had been tasked with finding an important trade route around Africa to India by his king, and established his country’s claim to the territory by erecting a stone pillar topped with a cross called a padrâo. Once a small yet extremely wealthy diamond mining community, today Kolmanskop is an eerie ghost town long abandoned by time and slowly sinking back into the sand of the Namib desert. When diamonds were discovered sitting on top of the sand in 1908, hundreds of German miners flocked to the area to make their fortunes. Over the next 40 years the town flourished, and soon resembled a grand German town complete with power station, hospital, school, ballroom, theatre and sports hall, bowling alley, and an ice factory. The town was so advanced it also became home to the first X-ray machine in Southern Africa. The town was completely deserted by 1954 after a richer supply was found further south, and fell prey to the scarring winds and sands of the Namib desert. Nowadays the site is a museum, and well worth the day trip from nearby Luderitz to explore the grand mansions of days gone by as they slowly sink back into the desert. On your way to the town, keep an eye out for the other ghostly inhabitants of the area: the elusive wild horses of Aus! Believed to have been left behind after World War Two, up to 150 wild horses have adapted to life in the Namib, and now roam the sparse vegetation of the desert plains. In the heart of one of Namibia’s most wild and beautiful landscapes, the Damaraland, a towering 1987m high granite mountain rises straight out of the desert. Nicknamed the ‘Matterhorn of Africa’ due to its dramatic shape, Namibia’s Spitzkoppe is all that remains of a 700 million year old ancient volcano. While you can climb to the top (with some ropes and technical know-how), there’s just as much adventure to be had in the surrounds. Head out on one of the many hikes and explore the unique landscape; imposing boulders, ancient caves, rich vegetation, and desert plains, or hang out at the Rock Archway snapping some epic photos. Or, if you’re after something a little more cultural you can go in search of ancient bush paintings estimated to be up to 6,000 years old, then watch the sunset light up the granite boulders with streaks of red and orange, before retiring to your campsite under the endlessly starry Namibian sky. Desert dreams are made of these. Where to stay in Spitzkoppe | Spitzkoppe Camping on one of the many campsites within the national park. Each campsite has basic facilities, including toilet and braai/barbeque. MORE OF AFRICA: OKAVANGO DELTA VS CHOBE NATIONAL PARK – WHICH BOTSWANA SAFARI SHOULD YOU CHOOSE? If Namibia’s epic desert landscapes have you feeling desperate to see a living tree again, then leave the sand dunes and desert air behind and head up North to the narrow strip of land known as the Caprivi. The landscape changes drastically here, thanks to the life-giving waters of three important African rivers: the Okavango River, Chobe River, and the Zambezi river. The fertile floodplains and lush countryside here feel like a mirage after the dry air and dusty plains of southern Namibia, making it ideal for bird-watching and wildlife spotting. The best part about the Caprivi strip is that it’s still pretty unknown on the main tourist route in Namibia, partly due to being closed off for years during the neighbouring Angolan war and Namibia’s independence struggles. The more relaxed vibe lends more authenticity to the area too. Hotels give way to small villages and marketplaces, and the rural streets are lined with a mix of friendly people, cattle, and the odd goat instead of big tourist buses. It’s the perfect place to relax along the river while bird watching or enjoying the sound of hippos calling to each other, or to enjoy a sundowner from the deck of your houseboat as a classic African sunset puts on a show for you. Cheers! Like most African cities, Windhoek is a mix of colonial history and African urban buzz. Here, you can learn about the country’s rich history, shop till you drop in the many markets, or simply enjoy great food and beer under the ever present African sun. Although we don't recommend spending too much time in Windhoek, be sure to check out Christuskirche, the ginger-bread style church in the centre of town, visit the local craft markets in town, have a local ale (or 10) and Joe's beer house, or relax in the African sun at the Parliament gardens. A great place to stay is Urban Camp. Centrally located with comfortable camping grounds, its got big shady trees, wi-fi internet, nice bathrooms and a sparkling pool. To start your Namibia road trip, you first have to get to Namibia. International flights will arrive at Hoseo Kutaki International Airport, Windhoek. Book your flights to Namibia using Skyscanner, which is in our opinion the best flight search engine. Namibia has an exhaustive array of accommodation options, with everything from high-end lodges through to campsites. For such a large country, accommodation can be found just about anywhere, whether it be a sleepy roadside town in the middle of the desert, or incredible lodge in the heart of Etosha. If you're looking for hotel or safari lodge accommodation in Namibia and don't know where to start, we recommend using Hotels Combined, the world's best hotel comparison site. You can also use Booking.com to find accommodation you're looking for at the lowest possible prices. We used our Lonely Planet Southern Africa guide religiously on this trip and recommend you purchase and read one before travelling. Buy your guide here. We also recommend purchasing a Namibia roadmap such as this one. We're of the belief that you should never travel without travel insurance, ever. But if you don't always use it, you must for a Namibian trip. When it comes to travel and safety in Namibia, take the normal precautions you would anywhere, such as never leaving valuables or bags unattended in your car, and being wary of those around you at ATMs. In some areas, we recommend that you don’t wander alone or catch taxis late at night (particularly after 9pm) as there have been reports of armed muggings and theft of tourist's backpacks. We used World Nomads when travelling through Namibia, and recommend you do too. What were your Namibia must see attractions? Are there any we've missed? Let us know in the comments below! LIKE IT? PIN OR SHARE IT!